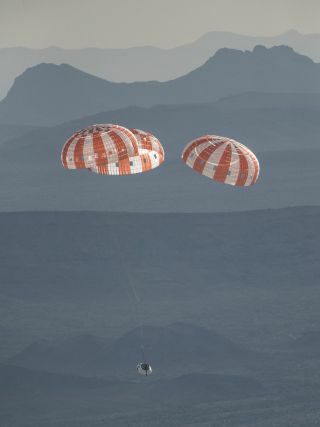 NASA tested the Orion spacecraft's parachutes March 16, 2018, at the U.S. Army's Yuma Proving Ground in Arizona. NASA will run its final parachute test for the Orion spacecraft today (Sept. 12) as the agency readies Orion for its first uncrewed mission around the moon. NASA will start coverage of the test at 10:15 a.m. EDT (1415 GMT) on NASA Television and the Orion Facebook page. Viewers can ask questions on social media using the hashtag #AskNASA. You can watch the test here on Space.com, courtesy of NASA TV. Several NASA employees will participate, including Orion program manager Mark Kirasich, astronaut Randy Bresnik and Orion parachute engineers, according to a statement from NASA. "To date, such tests have evaluated Orion's parachute performance during normal landing sequences, several failure scenarios and a variety of potential aerodynamic conditions to ensure the safe return of astronauts from deep-space missions," NASA said in the statement. Orion's first test flight is expected no earlier than 2019, when the spacecraft — riding on top of the Space Launch System — will be launched toward lunar orbit for a two-week mission. While this test flight will be uncrewed, NASA could eventually use Orion for trips beyond low Earth orbit. The agency is working on plans for a Lunar Orbiting Platform Gateway (which deep-space station in orbit around the moon) and has also talked about bringing people to Mars.